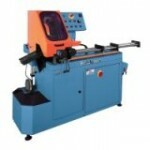 • CPO 275 PKPD and CPO 350 PKPD are semi-automatic machines. The Scotchman Non-Ferrous Series of cold saws provides the cleanest of cuts in solid or extruded aluminum. These machines provide straight, burr-free cuts; easy mitering; and safe operation without sparks, heat, or burr. These machines are available in all stages of automation–manual to fully automatic– and are built to last. • the CPO 350 NF PKPD is a semi-automatic machine. Scotchman’s Column Style Cold Saw, the CLM 350 SA, features a rigid column style which allows cutting up to 4” solid tool steels, fast and efficiently. It is rugged enough for tougher alloys and heavy wall tubes. This semi-automatic machine can be operated with either the dual push button start or optional foot pedal. The machine will start, clamp, cut, return, and unclamp; plus, it delivers consistent production without operator fatigue. Scotchman Automatic Cold Saws cut material fast, accurately and clean. Our cold saws feature rigid high-speed steel blades, double clamping, full coolant or mist lubrication systems, and dual control of feed pressure and rate–all these features combined result in high quantities of burr-free, accurate cuts. The Scotchman HFA Series utilizes an automatic shuttle vise feed system that handles up to 30 inches in a single stroke and up to three strokes standard. The Scotchman RFA Series utilizes a roller feeding system. These machines are ideal for longer length parts because they can be ordered with either standard 60″ or optional 90″ or 120″ outfeed stops. The infeed system can be supplied with either a supply table or a bundle loading attachment.